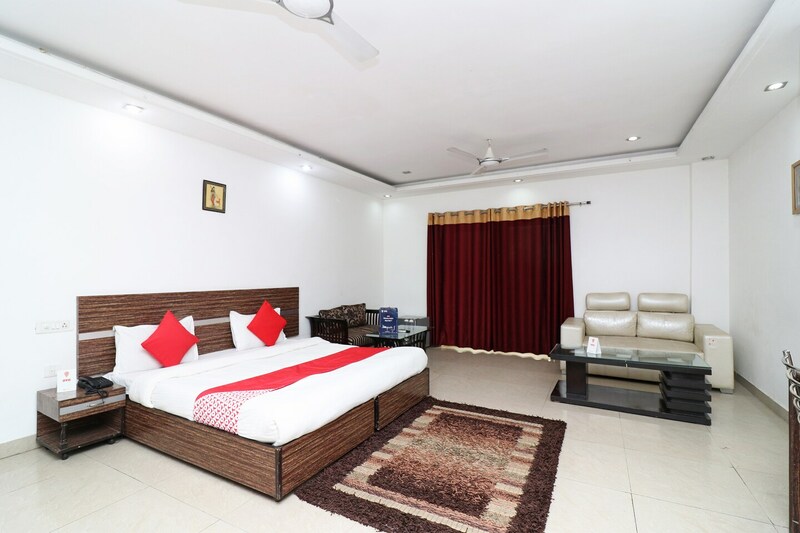 A budget friendly and comfortable accommodation near AIT Chowk Bus Stop. A.I.T. Chowk Bus Stop, Sector 55-56 Metro Station and Alaknanda CGHS Bus Stop are situated near the comfortable abode of Hotel Lotus Park. Pawtel is also situated a few kilometers away. The stunning rooms of Hotel Lotus Park are adorned with a beautiful and elegant false ceiling with elegant accentuated light fixtures giving the rooms a sophisticated look. The dark stained and comfortable furniture act as a perfect contrast for the chosen wall palette. The budget-friendly rooms are very spacious. The hotel also houses a comfortable seating area. AC, TV and free Wi-Fi are provided for the comfort of the guests. Parking and power backup facility is also available. Nearby restaurants include Daawat-E-Kashmir, Harish Bakery and Restaurant, Moti Mahal Delux, Tossin PIzza, Subway, Pizza Hut and Bikanervala. Naivedyam and Indian Grill Room are also located at a walking distance from the hotel.